When Glenda invited me to write a guest post about providing customer service to people with disabilities, I was honored. Then, I was nervous. 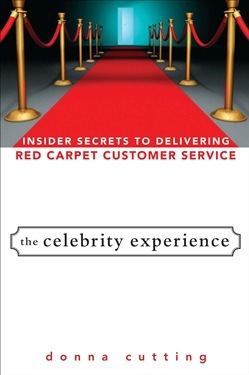 While providing a red-carpet customer experience is my area of expertise, I would never presume to call myself an expert on the American Disabilities Act, accessibility, or the various needs of people living with disabilities. Perhaps that’s why I am the perfect person to write this post! Because even with my years of past experience in the field of elder-care, and working with people who have developmental disabilities, I am smart enough to know that I know very little. My guess is that most service professionals are in the same boat – they may know even less. Yet, they meet people living with disabilities every day. They’re called customers. A few months ago, I was in the airport riding on a shuttle from one concourse to another. The shuttle was full of people, and behind me was a party of three – two airport employees and one woman who was in a wheelchair. One of the employees was apparently escorting the woman in the wheelchair to her gate and like me, they were taking the shuttle to get there. While they rode, the two employees carried on a loud conversation with each other about another employee and how she had refused to ‘do wheelchairs.’ “I’m sick and tired of doing wheelchairs,” one of them said. “Why should I have to do all the wheelchairs when she gets out of it?” “I know,” the other one exclaimed. “I’ve pushed three wheelchairs already today, and I’m just going to refuse from now on.” Wow. I didn’t know what to do, quite frankly. I couldn’t believe they were having this conversation right in front of this woman, without regard to her feelings at all. I looked at the woman in the wheelchair and smiled at her. She smiled back and lifted her shoulders in resignation. I refrained from commenting, thinking the woman had already been embarrassed enough. But I wonder if I made a mistake. Someone should have called those young women on their behavior. Here’s what I think Managers can do to ensure that EVERYONE – including those living with disabilities – gets red-carpet treatment from their employees. Hire people who have the sensitivity to treat people with kindness. If someone is going to be serving your customers, kindness should be in the job description. 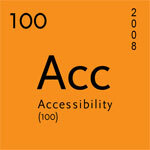 Learn everything you can about the American Disabilities Act and accessibility laws. Ensure that everyone on your team has this information. Learn how to reframe your language when discussing people who have disabilities. For instance, that airport employee wasn’t “doing wheelchairs.” She was escorting a PERSON who uses a wheelchair. Provide exceptional, ongoing training on the needs of your customers living with disabilities – to ensure that they are given red-carpet treatment – and that their unique needs are met with their dignity intact. Hold your team accountable for their actions! Do not tolerate employees who treat unkindly, condescendingly, or without dignity. 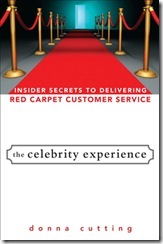 Portions of this blog post are excerpted from The Celebrity Experience: Insider Secrets to Delivering Red Carpet Customer Service (Wiley, 2008) by Donna Cutting. Used by permission only. This book excerpt was part of a blog tour brought to you by Key Business Partners. To the Employers Who Refused Me a Job, You Lose! With two virtual book tours under my belt in promoting my autobiography I’ll Do It Myself, I’m now have a better sense of what contributes to the success of this kind of book promotion. My first virtual book tour “40 Blogs in 40 (Business) Days” was way too long, particularly for my first attempt at this kind of marketing. My new blog still had “Wet Paint” signs and I had only 10% of the appearances confirmed when I headed out, which added to the excitement of the experience in that I literally didn’t know where I was headed next. It meant I was scrambling to find bloggers while I was answering interview questions, which meant many late nights. No wonder I ended up with bronchitis for a month at the tour’s end, losing the momentum I had built over the eight weeks. The second tour “Summer Sojourn” was only two weeks and was much more enjoyable. Because my blog is more established, finding willing hosts within my target market was significantly easier. This time I headed out with 80% of the appearances confirmed; the other two dates were easily filled thanks to the networking I’d been doing. Book sales also dramatically increased. On the “Summer Sojourn” tour, a theme unexpectedly arose that most of the hosts continued. Seeing where my Ferrari 360 Spyder would take me next added another dimension to the experience for the readers, encouraging them to follow the tour more closely. Amazing! I couldn’t have planned that magic better if I had tried! From my experience, the key to successful virtual book tours is short, targeted and themed. I’ll keep this in mind while I plan my British tour. Watch for details in a few weeks! After two weeks of amazing travel, I wearily flew back to Australia (wishing these weren’t virtual air miles) for the final appearance on my Summer Sojourn virtual book tour, promoting my autobiography I’ll Do It Myself. Upon landing at Brisbane Airport and meeting Yvonne Russell from Grow Your Writing Business, my energy was renewed. I had arrived in time for the 10th Anniversary River Festival, with fireworks planned for that night. What better way to wrap up my book tour! While Yvonne graciously showed me around the city, we discussed virtual book tours, ebooks and secrets for writers. There was even some talk of a second book! Please join us. I also thank my readers for following along on my tour and offering your support. And, I look forward to getting to know the new faces I met along the way. Thank you. My Ferrari 360 Spyder now goes into the shop for a tune-up and I take the weekend off to recover from the jetlag. But, I will be well rested in time for Readers’ CafÃ© on Wednesday, September 5th, at 4pm (pacific time) precisely. Hope you can join us. Have a great long weekend and thank you! 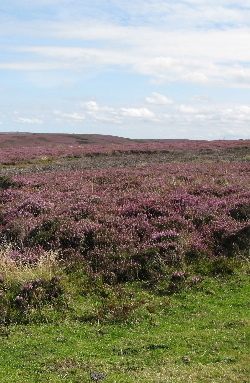 Early this morning the Learjet landed at Heathrow and I drove the leased MG Midget to the north of England, through the moors covered with purple Heather and thinking about my mom Heather. At the Moors National Park Centre I meet Emma, an avid knitter â€“ another reminder of Mom. Emma is also mom to adorable Oliver who turned eight earlier this week and has cerebral palsy. While Oliver and his Dad entertained themselves with his new Nintendo, Emma and I chatted about friendships while growing up with a disability, finding funding for much needed equipment, and using communication devices. Join us in the beautiful English countryside. I now fly back to Australia (who arranged this itinerary?) for the last stop on this magical Summer Sojourn virtual book tour. But I sense I’ll return to England in the near future. For now, please cast your daily votey so I may win the opportunity to be paid to blog for a year (be sure to click on â€œVote for Glenda Watson Hyattâ€). My goal is #3 by Labour Day. With your support, I know I can do it. Thanks! See you tomorrow, down under! Overnight I was back on the Learjet, flying to Isabella Plains, a suburb of Australia’s capital city Canberra. This trip to the land down under I am meeting with Ruth Ellison, an interaction designer who is extremely passionate about creating accessible and useful user experiences. Today we chatted about living with cerebral palsy, our common passion for web accessibility, and a new term I recently coined: Disability 2.0 â€“ “Nothing about us without us”. Please join us. Tonight I board the Learjet for the United Kingdom â€“ I’m training for the life of the rich and famous! I Can Communicate, But Is My Voice Being Fully Heard?